Dogs and spending time outside go hand in hand. Seeing your pet run and play and roll on the grass is a beautiful experience that all dog owners can relate to. Precisely because of that, it might feel a bit counter-intuitive to even consider getting a pet bicycle basket. To say that dogs enjoy walking and running alongside you especially when you’re on a bicycle is an understatement, so why would you need to buy a dog bicycle basket? Well, there are actually a lot of reasons to make that decision. For one, you might be living in a crowded neighborhood with high traffic volume, and cycling to a green surface or a dog park is often the way to provide your dog with the ideal environment for playing. Additionally, the concrete may be too hot for your pup’s paws to handle, or you don’t want it to spend all its energy by walking to the park, or – let’s face it – you might be in a hurry to get somewhere, without your furry friend stopping at every pole to sniff around and explore. If you’re a fan of cardio, or you just like getting around town on your bike while enjoying the company of a man’s best friend, you’ll find useful reviews, tips, advice, info and buyer’s guide for the best pet bike baskets on the market. Our winner is definitely an all-around player. The PetSafe Solvit is a wicker pet bike basket with a unique, traditional look that gives off the vibes of the French countryside in the sixties. Aside from the fact that wicker makes it look retro and stylish, it also allows for the breeze to go through it while you’re riding, offering an enjoyable trip to both you and your dog. It weighs in at 4 pounds, making it one of the sturdier dog cycle baskets around, and it’s suitable for pets that weigh up to 13 lbs. On the other side, its sturdiness accounts for its amazing durability, and the materials it’s made of are weather resistant, meaning that while it looks luxurious, this dog bicycle basket is pretty low-maintenance. 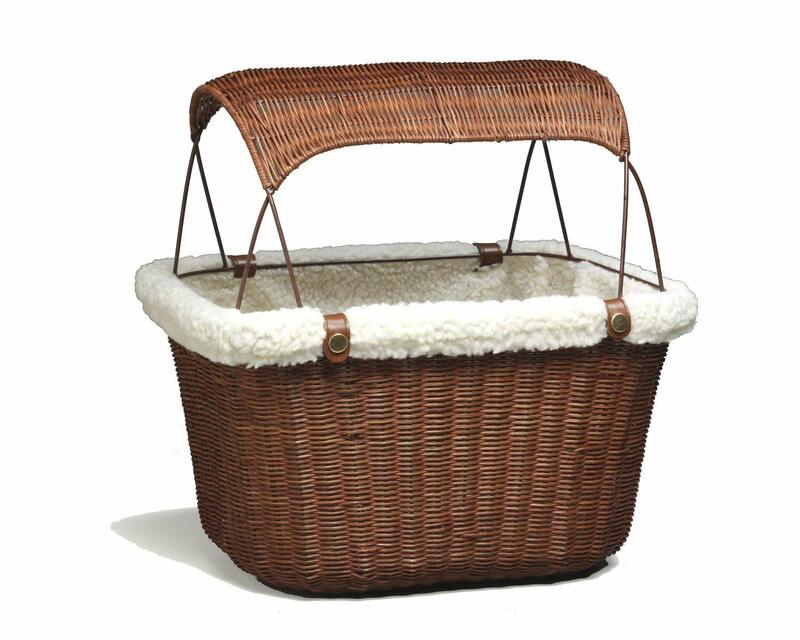 The inner faux-sheepskin material on the inside will make your pet feel comfortable to sit and lay in the basket. And don’t worry about it being too hot in summer – precisely because of the outer wicker design; your pet will always be at an optimal temperature. Also, there’s no need to think twice about the sheepskin becoming dirty and full of hairs. It’s surprisingly easy to clean, actually. It’s easily washable – all you need is cold water and a bit of mild detergent. Just line-dry it afterward and you’re done. As for the overall security, the PetSafe Solvit basket covers all the basics. There’s an adjustable safety leash that keeps your pet secured while riding and also prevents it from jumping out of the basket in case it gets scared in traffic. You also get a removable sunshade that really helps minimize sun exposure in hot summer days when it may be dangerous for your pup to bask in sunlight for long. Being on the heavier side, the basket comes with three-way adjustments on the bracket that guarantee a secure fit on any bike. 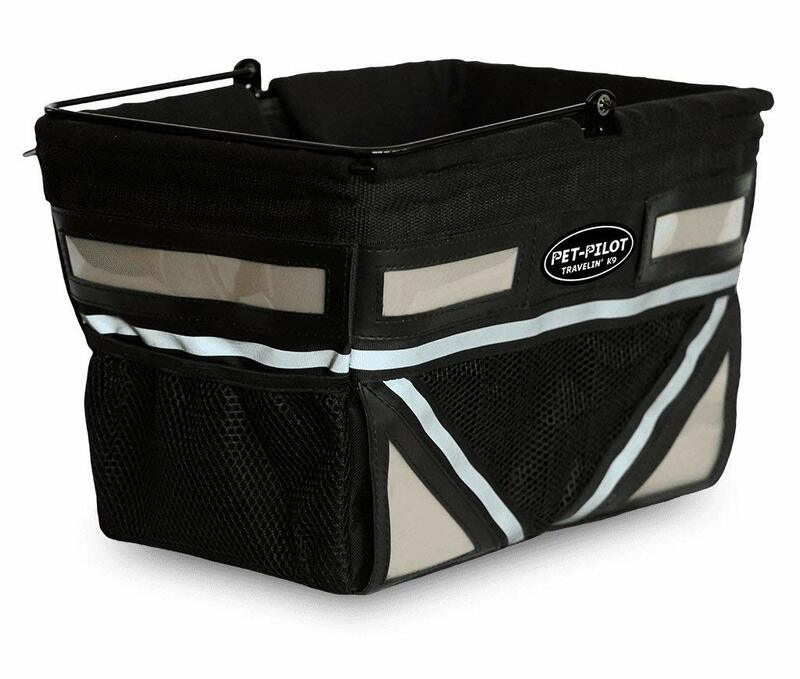 What the Pet-Pilot bike dog basket carrier lacks in beauty, compared to the much more style-conscious PetSafe basket, it makes up for in practicality. Our pet bike basket runner-up has even been improved in 2018. according to the buyer’s feedback and reviews. The reason we prefer the PetSafe basket over this one is that it’s suitable for dogs that weigh up to 10lbs, compared to the 13lbs maximum weight that our winner offers. It might seem like a small difference, but in reality, those extra 3 pounds are make-or-break for thousands of pet owners. However, some people report that this basket has carried their pets that weigh as much as 20lbs without an issue, stating that the dimensions of the basket are more important than the weight of their pet, due to the steel frame that can hold up a lot of weight. The basket itself weighs 3lbs. In the category of strictly small dog bike baskets, the Pet-Pilot is a choice you won’t regret. Most users agree that installation of the basket is a breeze, and its sturdiness is unparalleled, given that this basket features a steel frame with rubber bushings. Speaking of breeze, the mesh wall on the front allows for cooling airflow while riding the bike, providing optimum comfort for your furry friend. 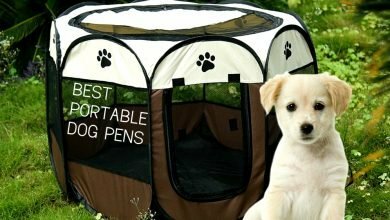 Its floor is padded with foam and its side walls are tall with a large opening on the top, which means that your dog will have plenty of room to move inside it comfortably. It comes in 8 different colors, so you can easily pick one that will complement the look of your bike. It features reflective strips on the front and side walls that provide extra security and increase traffic visibility at night. The best part about the Pet-Pilot basket is the additional storage room. It has side mesh pockets where you can put your keys, wallet and mobile phone, as well as a water bottle and your dog’s leash. It also comes with 2-point chrome clasp safety leash that is attached to the harness, providing extra safety for your little one when you’re on the road. Coming up at third place, the Snoozer Sporty basket has some unique features of its own. While it also weighs 4lbs, it’s collapsible so it can be stored flat when you don’t need it, making it a bit more practical than the PetSafe basket. With the ability to hold pets up to 14 lbs, this basket has one foot into the “bike basket for medium dogs” territory. Some buyers even say that it was more than sufficient for their dogs that weigh up to 20 pounds, but keep in mind, that is well over the recommended pet weight for this product. Most dogs that range from 14-20lbs might only have the option to sit in this basket due to their size, but it can still be very comfortable for them to ride in. It has a removable inner pad and chin rest as well, for those puppies who just love the breeze in their face while riding. While it’s the least stylish of the bunch, it’s the easiest to clean. The durable microfiber material takes several wet-wipe swipes to look completely new again. 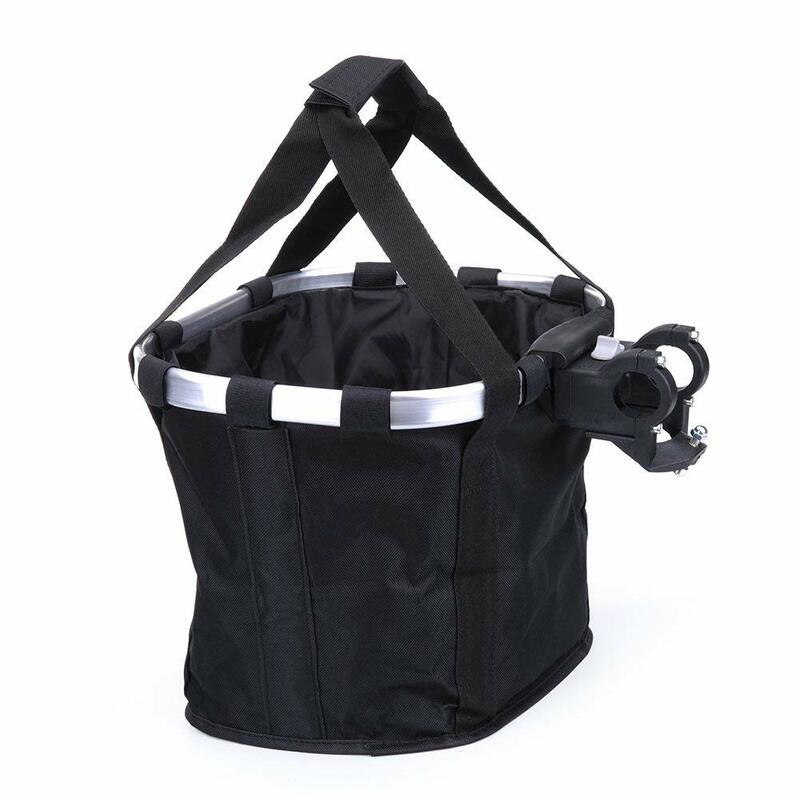 As for the storage, this bicycle pet basket carrier comes with a lot of side pockets and an inner leash clip. It doesn’t have a sun shade, but it does come with a rain cover that is stored in the side pocket, which can also come useful when protecting from the sun. Mounting and removing this basket from your bike is as easy as it can be. The 10-inch buckles are placed on the bike handles and secured. Keep in mind that you have to secure them tightly, in order to prevent swaying and bouncing as much as possible. This bicycle dog basket carrier isn’t just that! 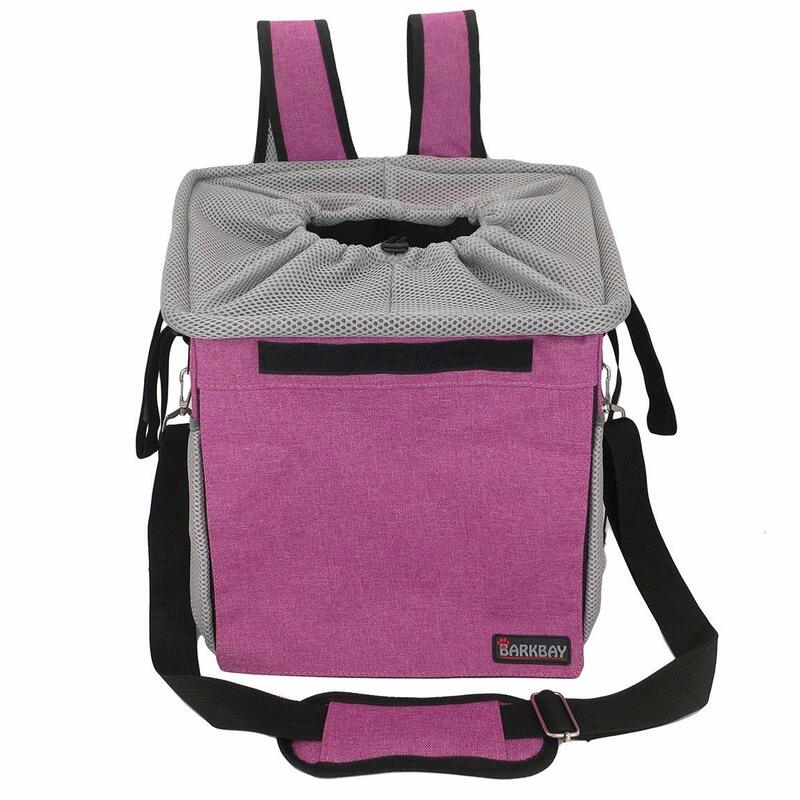 It can be used as a pet backpack, a shoulder bag, or even a car seat carrier! 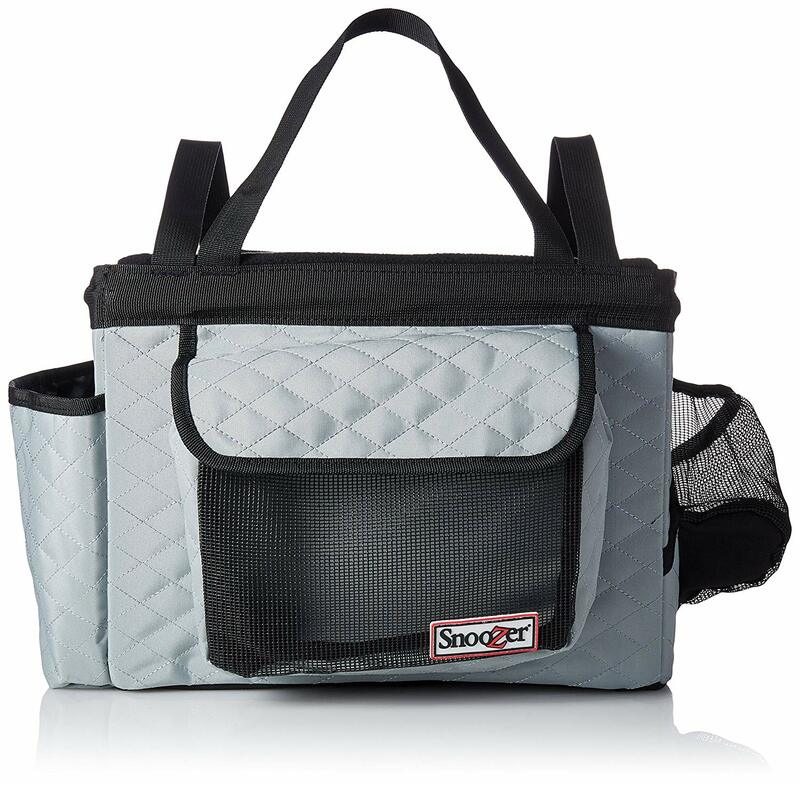 It has mesh venting and storage pockets, with a maximum weight capacity of 18lbs, making it a great option for smaller medium-sized dogs. However, keep in mind that a lot of customers think that it is too small to actually fit an 18lbs dog, so it’s best to do some exact measuring before deciding on his purchase. Also, one customer complained that the inner leash clip broke, so while this is a practical option for you and your dog, it’s just not in the top 3. If you’re not willing to spend over 30 dollars on a bike basket and need one for an occasional bike ride, this might be ideal for your needs. 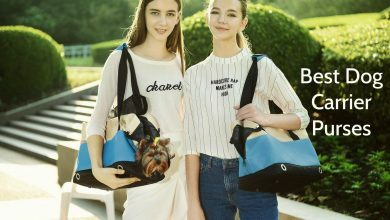 It’s made out of water-resistant material, has an Aluminum frame and a drawstring top closure for extra security and is suitable for small pets. On the flip side, attaching it to your bike isn’t as intuitive as with the other baskets, and the water-resistant material may cause your pup to become too hot if riding for longer than half an hour while enclosed. All in all, this is a reasonably priced dog basket for the bike that is ideal for an occasional weekend ride to the park. 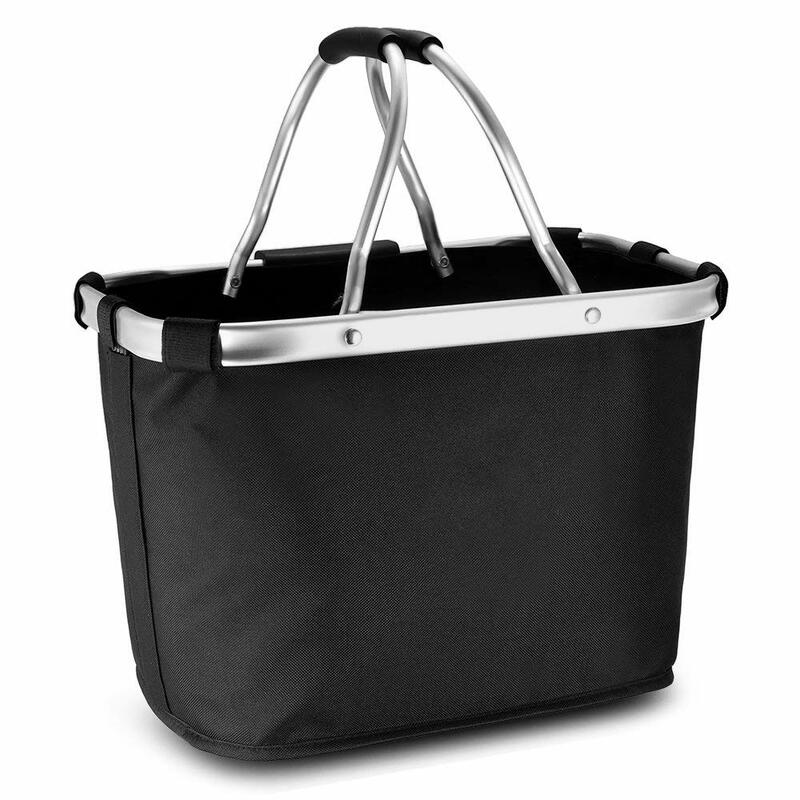 Made out of water-resistant oxford cloth and Aluminum frame, this basket can carry up to 11lbs of weight. 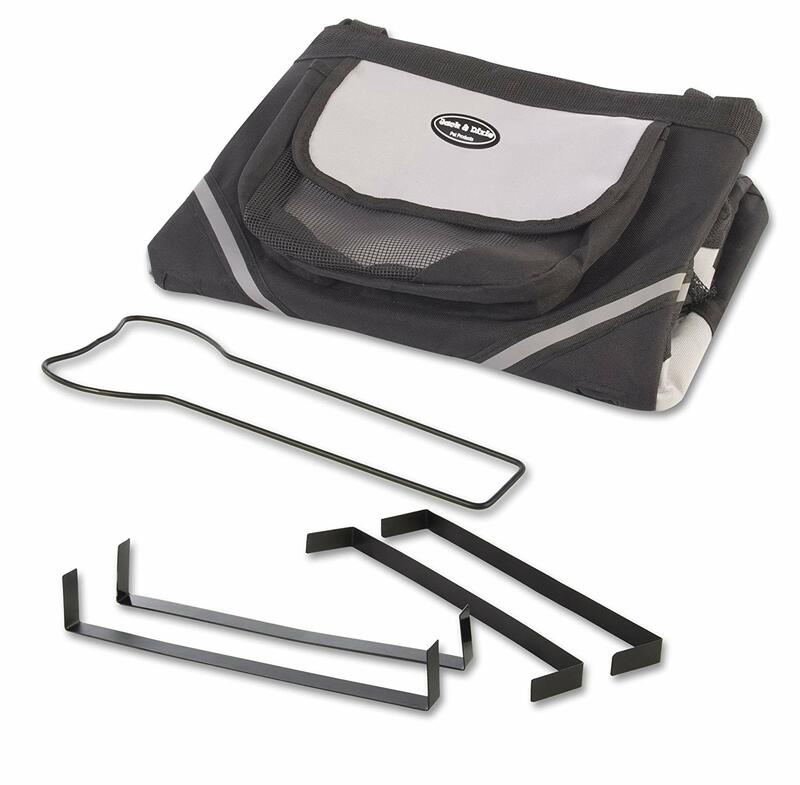 It comes with inner pockets and two handles so it can be used for carrying around, and not just mounted on the bike. However, some customers are complaining that the quality of this front bike basket for a dog isn’t the best, so you can expect some problems with the zippers and line along the way. On the other hand, a lot of customers are satisfied with their purchase and feel that at this price point, this dog basket is well worth the purchase. This elegant dog basket for bike has a maximum weight capacity of 15lbs, looks gorgeous and features adjustable authentic leather straps with brass buckles. However, unless your dog is incredibly well behaved, this basket doesn’t offer any security features such as a leash or leash clip, or even a mesh top that can be zipped up. Similarly to the PetSafe basket, it doesn’t have additional storage available. On the other hand, these aren’t deal breakers because all of these problems can be fixed in other (although less practical) ways. A puppy bike basket that doubles as an over-the-shoulder carrier and costs under $50 are a win in our books. This basket comes with two compartments with zips, a safety leash, and an adjustable shoulder strap. It can hold up 15lbg of weight, but the customers think that getting an additional rack for support is a good idea. If your pet is below 10 pounds, we think that purchasing the rack won’t be necessary. This front bike basket for dogs has straps that make mounting it on your bike easy, but that comes at a cost of swaying more than some other baskets. Also, the weight of the basket itself it 4.5lbs, which may make it difficult for you to turn the bike handle fast, at least for some time, while you adjust. Due to its weight, this is an ideal bicycle basket for a small dog. For people who love outdoors, being active and spending quality time with their dog, a dog’s basket is truly a man’s second best friend. Not only are they comfortable and practical, but they also create opportunities for you to spend even more time with your dog. You can now have a great companion on your long bike rides with you, as opposed to leaving your dog at home because it might be too hard for him to walk or run all the way. Dog baskets can be attached on the front or the back of the bike depending on the type and size, although the front bike dog baskets are the most common type of all. They can carry small and medium dogs, depending on the basket dimension. Dog front bike baskets have a simple build: the basket itself, which can be made out of the myriad of materials, ranging from wood and wicker to microfiber, with sheepskin or foam paddings on the basket floor and walls, and some even have steel or Aluminum frames for extra support. Other than the obvious part, dog baskets often feature a security leash, inner or outer storage compartments, stability racks and some sort of mechanism to attach it to your bike. This mechanism can be as simple as putting basket straps around your handle or a bit more complicated; some even require additional hardware and a bit of niftiness to secure, but those baskets tend to be more durable and sustain greater weights. There are three main types of dog baskets, and they all have some pros and cons to them. The sturdiest and most reliable are often hard baskets, which are made of plastic; we’re not talking about the frail, easily breakable plastic we’re used to seeing, but rather a more industrial, durable plastic such as polypropylene. These hard baskets are easy to clean and maintain, their inner lining is usually washable, and they often have some kind of sidewall ventilation, but due to the fact that their dimensions cannot adapt to a bigger dog, they are ideal for smaller breeds. Soft baskets are equally as easy to clean because they, too, are made of durable materials that are easy to clean, such as microfiber. Most soft baskets have mesh opening on the basket walls that allow for sufficient air circulation. They sometimes have a drawstring or a zip opening at the top, as well as a plethora of other miscellaneous features that make them the most practical of the bunch. They can be less sturdy than their hard counterparts, but they also offer more space, because the soft materials are able to adapt to your dog’s size, even if it is leaning towards a medium-sized dog. The last type of dog baskets is the cardboard basket, which leaves little to the imagination. It’s shaped like a box and made out of cardboard with holes for ventilation. It might sound as an average DIY project, and that’s probably why not a lot of people buy them, but don’t be fooled – they are glued with materials that make them water resistant and with proper support, they can carry some extra weight without a problem. That being said, they’re certainly the least cute-looking dog baskets of all and don’t offer the same amount of comfort as the previous two. While being straightforward with their purpose and use, dog baskets can be refreshingly versatile. They can double as a dog carrier in forms of backpacks, shoulder bags or handle bags. If you prefer not to take it off your bike once mounted (which is to be expected if it takes some hardware to take it off), you can use it to carry your groceries or bag in it, when your dog is at home. If you’re in need of a bike basket for dogs up to 20lbs, there are some options on the market that users have deemed more than able to carry that sort of weight. The important thing while shopping for that sort of basket is to contact the manufacturer and also read up on user reviews and see if that’s the right basket for you. Manufacturers will sometimes state a lower weight as the maximum weight for their basket just to be on the safe side and avoid returns, but the truth often lies in the reviews. For instance, both the Travelin K9 and Snoozer Sporty baskets are known to have been a good choice for 20lbs dogs, even if 10-14lbs of weight is their official maximum. However, if you’re a proud owner of an over 20lbs dog, you might want to consider bike trailers. They are more demanding in terms of proper installation, but attaching one behind your bike will likely prove to be a great decision that both you and your dog will enjoy. The best thing to do when buying anything, not only dog baskets, is to stop and think about what you need, rather than immediately start looking at what’s offered. First thing’s first. Consider your dog’s size. We’re not talking about its current size, but rather the maximum size of its breed. While a good dog basket isn’t precisely an investment, you shouldn’t throw away money and buy two just because you bought the wrong size. Consider the potential for weight gain of your dog’s breed as well. 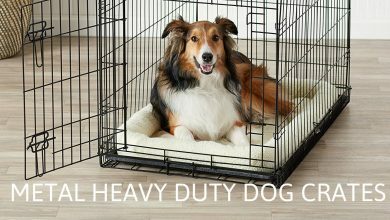 Now that you have an idea of what your dog will weight at its heaviest, decide on the basket size. As we previously said, there aren’t a lot of options on the market for a large dog bike basket, but a lot of the officially smaller-sized baskets may well be able to fit your dog. If your dog is fully grown and fits into the dimensions of a hard basket, then there’s no reason why you shouldn’t buy one. However, if there’s still some weight to be gained, opting for a soft basket is a safer option, because it gives you some wiggle space, so to speak. Depending on your dog’s size and character, you’re going to want to make sure that you’ve taken every precaution necessary to keep it safe on your bike ride. For example, there are pups that are easily frightened by traffic, closed spaces, noises, sudden movements, bumps on the road, etc. Think about what puts your dog on edge and how stressful the bike ride (especially the first few) would be. An average-priced dog basket has an inner leash clip at least, while most top rated ones feature an adjustable security leash that’s a part of the basket, so as to prevent your dog from jumping out while in motion. The length to which the leash will be adjusted to depends completely on your assessment of your dog and how it will behave on the road. Some dogs enjoy sitting in the basket and looking out on the road, or at you, while others use that time to lie down and take a nap. If your dog is the watching type, you might consider getting a basket with a zip mesh top or a drawstring top, so that you can secure the dog even more while riding and looking out the basket. On the other hand, some dogs just hate having a basket top – this is a chance you’ll have to take. Save for some short rides here and there, where ventilation might not be a crucial element of a perfect dog basket, it’s really important to look at how the materials work to provide ventilation. For instance, if you have a basket made of wind-proof and water-proof material, without any ‘windows’ or holes in its walls to provide ventilation, your dog could easily overheat on longer rides. Look for baskets that have mesh ventilation parts on the sides or on the front basket wall, or for some that are made out of wicker in a way that lets through a breeze while riding. Dogs love the wind in their hair as much as anyone! If you’re planning on taking your dog to longer bike rides through nature, make sure that the material of the basket is weather resistant. You wouldn’t want to buy a beautiful basket, just to have it soak and fall apart when exposed to rain. Consider the typical bike ride with your dog. Is the road bumpy? Are you riding through nature, do you have a flat surface, or are you riding over earth and grass alike? In order to keep your dog calm, it’s really important to choose a basket that can provide stability (as much as possible) on a bumpy terrain. As you might have guessed, these baskets can be found in the pricier range, because they require high-quality materials and a bit more complicated way of mounting them to the bike. For those you just want to ride their bikes on flat roads without a lot of curves, just tightening the straps on your basket can be enough in order to gain stability. Pockets are commonplace even in baskets that are in the mid-to-low price range. They are characteristic for soft baskets. Hard baskets often have a uniform, sleek look that would be damaged if the additional pockets were to be put on the basket. If you’re carrying your cell, keys, and water on your bike ride, and you’re not keen on backpacks, we recommend taking a basket with outer pockets. 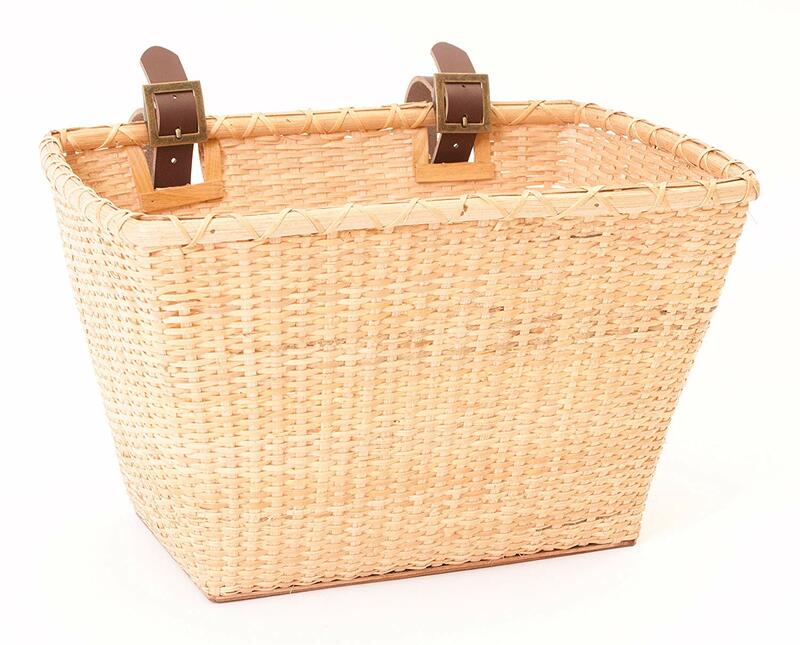 The most important thing when choosing this type of basket is to check the zipper quality. Go for sturdy zippers that look they can take a beating, because they’ll be the most used part of the pockets, and thus the first one to go south. As for other useful perks that your basket might have, rain covers and sunshades take the first place. For dogs that are on the heavier side of the small-dog spectrum, consider getting a stability rack – you’ll need it if your basket is attached only by bike handle straps. Also, consider getting a multifunctional basket, especially if you like to combine bike rides, picnics, and hiking. A dog basket and a backpack in one might prove to be an amazing purchase. Did you know there are companies that make handcrafted dog bicycle baskets? You don’t have to buy your dog a regular-looking basket online or at a pet shop. If you feel like your furry best friend deserves something special, you can have a dog basket custom-made! Expert safety tip: Always make sure that the dog basket is firmly attached to the bike, not just the first time, but before every single ride. Straps and screws can loosen up – you don’t want the basket falling in the middle of your bike ride with your dog in it. Also, make sure that your dog’s tail, fur, and paws are out of reach of any bicycle part in which they could get entangled. Staying hydrated on the road is as important to your dog as it is to you. If you have a side pocket or a bottle holder on your basket, consider getting a bottle and water dispenser. It looks just like any other sports water bottle, but it has a clip-on plastic water bowl (kind of) attached to it so that you can dispense water to it and make it easy for your dog to drink it. 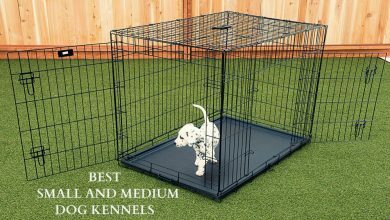 For lively puppies that need extra protection, you might want to buy a wired safety cage top. 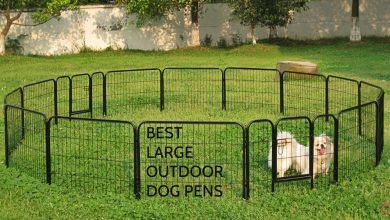 These are usually dome-shaped and guarantee that, once in the basket, your pup isn’t going anywhere. Getting a dog basket is a big change in your dog’s routine. Don’t think it’s a failure just because your dog needs a bit of time to get used to it. If it’s scared of the basket or the bike ride itself, work with your dog to eliminate that fear. First get the pup to adjust to the basket while it’s on the ground. Use treats and positive reinforcement to make it feel like a safe place, a place where good things happen. After a few days (or whenever you see that the dog has accepted the basket as a normal, not-at-all-scary object), try carrying your dog around in it. Introduce short bike rides around the neighborhood, all the while praising and treating your dog. After a while, it’ll get used to basket bike rides and learn how to enjoy them. Getting a pet bike basket is an important step for both you and your dog. It will open up new possibilities for you two to spend time together and it will teach both of you to trust one another. Your dog will learn to trust you more than before and enjoy the ride, and you’ll learn to trust your dog that it will behave. Dog baskets are one of the most affordable and safe ways to have fun with your dog while doing something you love.